Torres del Paine is a very famous and popular national park in the southern Patagonia, Chile. Thousands of people come here for trekking every year as a result it gets quite crowded during the season. The park has good infrastructure; well-marked trails, designated campsites, picnic areas, restaurants and shop, ranger posts etc. You can come to the park as a day visitor and do short hikes or venture to one of the longer routes; W-trek or O-circuit and spend trekking here between 5 to 8 days. The highlights of Torres del Paine; Las Torres (three sharp granite peaks), Grey glacier, Pehoe lake, Salto Grande, Nordenskjold lake – it’s a great place for outdoor, hiking and nature enthusiasts. For more information about hiking routes in Patagonia go to 35 Amazing hikes in Patagonia. The National park was established in 1959. It is located in the Southern Patagonia, Chile. Total area of the park – 181 400 ha. It got its name after three granite peaks of the Paine mountain range that look like towers (Torres from Spanish is “tower”). 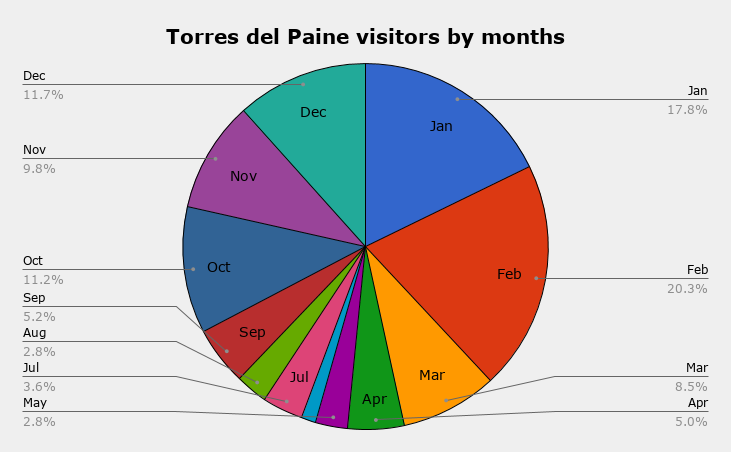 248 400 people visited Torres del Paine in 2017, 60% of them were foreigners. The park is huge, with several one day and multi day hikes, all trails are well marked and easy to follow. The W-trek and O-circuit start at Hotel Las Torres, 7km from Laguna Amarga (the entrance) to get here from the gate you can take a bus (US$4,4) or walk. Day hikes – there are 25 day hikes in the park, distances between 5 and 20 km. W-trek – 100km trail, 3 to 5 days to complete. O-circuit – 134km, a loop that goes around the park, in the Southern part of the park it joins with the W-trek, 7-9 days. Opened – November to March. Q-route – 154km, it’s basically the same as the O-circuit plus 20km extension; from Paine Grande to Administration exit, 8-10 days. Opened – November to March. If you’d like to visit the park and see most of its attractions but don’t have enough time for trekking you can visit Torres del Paine as a day trip from Puerto Natales. There are several day tours including hiking to Mirador Las Torres, Mirador Grey, Valle Frances and Lago Sarmiento as well as a mini bus park tour and glacier Grey boat tour. Depending on how much time you have and what kind of experience you’re seeking for. You can walk with a day pack, no need to carry a heavy backpack. Staying in a hotel instead of camping (for camping lovers it might be a disadvantage). You can choose when and what you want to see according to the weather conditions. You can spend more time trying to get a perfect shot or footage. It’s more expensive, there are no budget hotels inside the park but you still can camp. It takes away a big adventurous part of the hike. You won’t be able to see some remotes parts of Torres del Paine. It’s a good compromise between a day hike and a week circuit, takes between 3 to 4 days to complete, plus the route goes through the more developed part of the park with hotels, restaurants etc. You still have to carry food and gear but only for 3-4 days. If you don’t mind paying more you can even stay in hotels and eat in restaurants. W-trek can be done as a 5-day fully guided tour from Puerto Natales. This part of the park is very busy and gets quite crowded in season you don’t get a chance to get off the beaten trail. There are no free campsites on this route only more private or hotels. You see a lot more of Torres del Paine. You get a chance to skip crowds; some parts of the trek are quite remote and not accessible for day visitors. It’s a real hiking adventure. You have to carry a heavy backpack with gear, food and clothes for 7-8 days. If you’re unlucky with the weather it’ll be a very long walk in pouring rain and strong wind (it can happen anywhere in Patagonia not only in Torres). The same as for the O-circuit. You see even more places in the park. It’s a long hike, you’ll need 8-9 days to complete it – a lot to carry in a backpack. The extension part of the trail is not a circular route, it’s a return trek. The best way to complete this route is to take a catamaran to Paine Grande from Pudeto, CLP 18000/US$28 from there walk the O-circuit and finish with Paine Grande – Administration stretch. 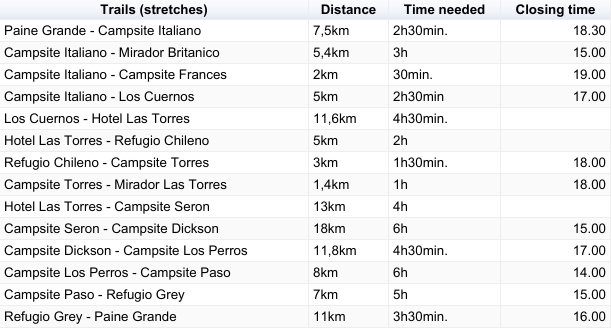 Torres del Paine trekking map; W-trek, O-circuit, Q-trek. Download Torres del Paine map. There is a CONAF office in Puerto Natales where you can book free campsites and get confirmation or you can book online through the site. Office opened Mon – Thu from 8.30am till midday and from 2.30pm to 5pm; Fri from 8.30am till midday and from 2.30pm to 4pm; Sat., Sun. closed. Office’s located at the corner of Baquedano and Yungay streets, near Erratic rock hostel. To get more information on Torres del Paine and some practical tips visit visit daily free talk meeting at 3pm at Erratic Rock hostel, near CONAF office. All hiking routes in the park are well-marked and have indications, distances, maps etc. The O-circuit and Q-trek can be walked only counterclockwise. The O-circuit (the Q) are opened only from 1st November to 30th March for 18/19 season. The W-trek can be walked any direction. Most of the trails have closing time, you won’t be allowed to start walking a stretch after the specified closing time. If you’re planning to stay for a night inside the park you must book your accommodation (campsite, hotel) beforehand. Take printed campsites booking confirmation with. Bring passport your bookings are made on your passport details. To keep your documents and phone dry on the trek use a waterproof pouch. There is no/very limited cell phone reception in the park. Hikers in all the time inside the park must stay on established trails. Camping is only allowed at designated campsites, wild camping is strictly prohibited. No open fires are allowed inside the park. Using of camping stove is allowed only at designated areas, campsites. Water in the park is drinkable, SteriPen or LifeStraw are optional. All waste must be carried with you outside the park (some private campsites have rubbish bins). Any outdoor activity involves a risky part with a possibility of getting an injury (even on a day hike) it’s always advisable to have insurance that can cover you in case something goes wrong. We’ve done many hikes all over the world and never had any accidents (except one time when I lost my backpack hitchhiking in Patagonia) but it’s always great to know that if something does happen you’re covered. 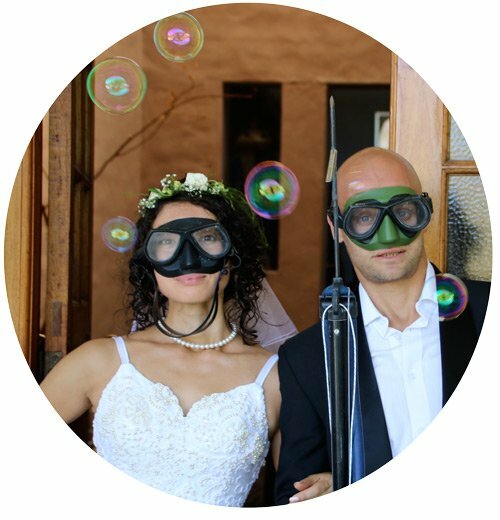 World Nomads Insurance operates worldwide they offer special insurance packages for hiking. Many people have used this insurance for trekking in Torres del Paine National park. Doesn’t matter where you live or where you are at the moment, it takes less than 2 minutes to get a quote and you can buy it online even if you are already traveling. Always read the small print and be sure you buy the correct policy. Be properly covered for injury, evacuation, gear loss, trip cancellation and trip delays. Transport – bus Puerto Natales – Torres del Paine (return) – CLP 15 000/US$23. Bus Hotel Las Torres – Laguna Amarga (for the O, Q and W-trek) – CLP 3000/US$5, optional. Catamaran Pudeto – Paine Grande (W trek) – CLP 18 000/US$28 one way. Entrance fee – CLP 21 000/US$32 in season, off season (May to September) – CLP 11 000/US$17; the price is fixed and doesn’t depend on duration of your visit; no matter if you stay for a couple of hours or a week. Accommodation – hotels between US$130 and US$350 for a double room, depending on the location and facilities. Hostels – between US$60 and US$80 per bed. Private campsites – between CLP 5000-13000/US$8-20. Currently there are only two free campsites in Torres del Paine. Food – cooking your own food – US$10 per day per person; eating out – between CLP 11 000/US$17 and CLP 16 000/US$25 per meal. Gear rental (optional) – to rent camping gear (tent, sleeping bag, cooking stove etc.) in Puerto Natales will cost you between CLP 13 000/US$20 and CLP 20 000/US$30 pp. per day, depending what you rent. At most paid campsites you can rent a tent, mat, sleeping bag but it’s more expensive than in the town. Tours in Torres del Paine (optional) – boat trip to Grey glacier – from CLP 70 000/US$107 pp. ; hike on Grey glacier – CLP 100 000/US$154 pp. ; kayaking to Grey glacier – CLP 66 000/US$100 pp. Tour operators charge; for a day tour from Puerto Natales from US$80 per person, for 5-day W-trek – around US$1200 (including transport, accommodation, food, gear, park entrance fee), for 7-day O-circuit – US$2000 (including transport, accommodation, food, gear, park entrance fee). It’s much cheaper, especially for longer treks. You carry a heavy backpack with gear and food for the whole trek. You pitch and break down a tent, make food, pack etc. The preparation stage is easy; no need to book campsites, find buses, rent gear or pack – all you have to do is to find a good company and pay. The trekking part is easier as well; no carrying a heavy backpack, pitching a tent, cooking, packing etc. You walk with a day-pack and your guides do the rest. Usually it’s more fun to join a group if you travel alone but in Torres del Paine there are many people chances of you hiking and camping on your own are basically non existent. It takes away the adventurous part. All the trails in the park are well-marked and easy to follow, you don’t really need a guide to show you the way or to find the campsites. 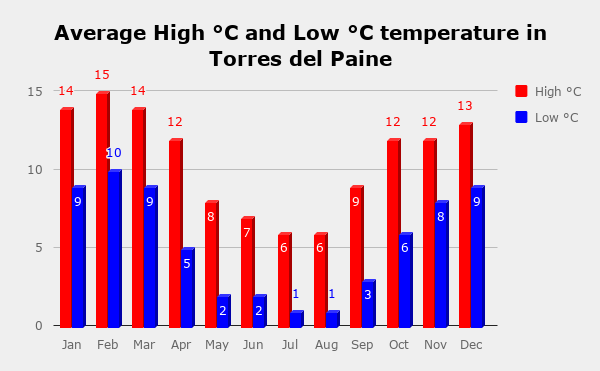 If you wonder when it is the best time to visit Torres del Paine here is some weather related data to help you planning. To characterize Patagonian weather in one word I’d say “unpredictable” – it can change in a blink for an eye from nice and sunny to stormy and rainy. Patagonia has four well-defined seasons; Spring – September to November; Summer – December to February; Fall – March to May; Winter – June to August. Summer and the beginning or fall is the best time for hiking in Patagonia. Temperature; December – March are the warmest months when even night temperatures are quite comfortable. April and November – are shoulder season; warmish days and not cold nights. In this part of Patagonia wind not rain is the main problem, it gets very windy which turns pitching a tent or cooking to a complicated task. 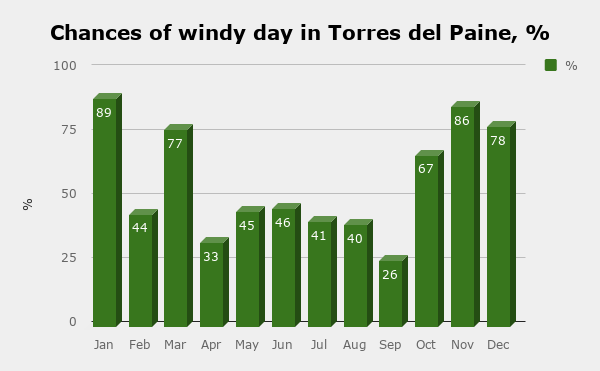 The beginning of summer November – January are the windiest months in Torres del Paine. February is the most comfortable in sense of wind and temperature. 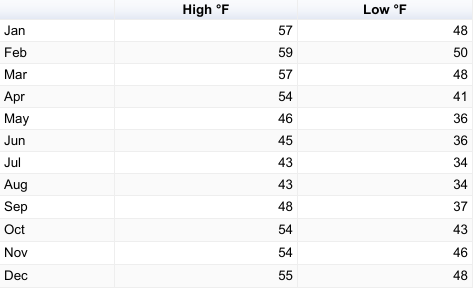 April to September is the least windy period but it’s too cold for hiking, plus long treks are closed for off season. 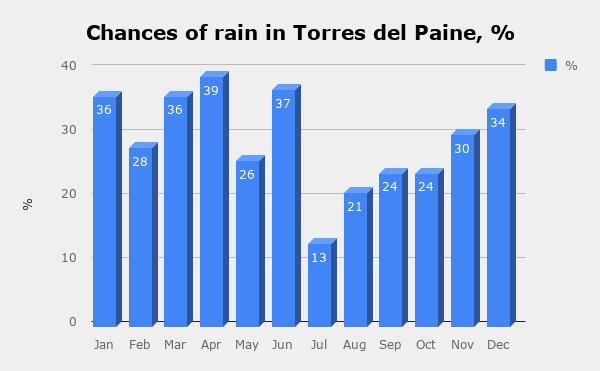 As you can see chances of rain are pretty even throughout the year, summer and fall months get quite a lot of rain, February again is the best month for hiking in Torres with the least rainfalls. In winter chances of rain are quite small though it can snow. 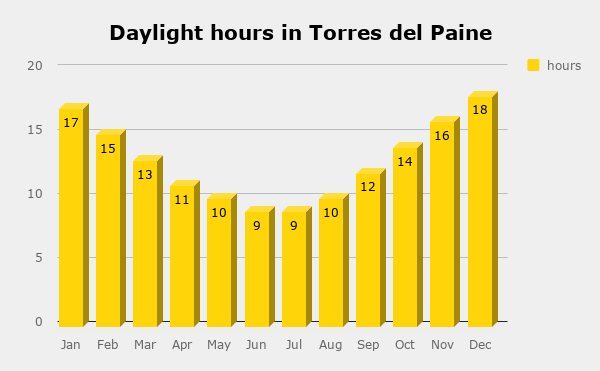 Day duration in summer in Patagonia is quite long, up to 18 hours of daylight! You have long hiking days even if you start later you’ll have enough time to complete a stretch with sun still high up. November – February it basically gets dark around 11pm, the sun rises between 4am and 5am. In winter daylight hours are half as long as in summer. From all the above you can make a conclusion that February is the best month for trekking in Torres del Paine; warm, little wind and rain, long days but it’s the busiest month for the park with the most visitors coming here. November, December and March might be a better option if you want to skip the crowds, plus all hiking trails are already or still opened, but these months get quite a bit more rain and are windier. We hiked in March and were lucky with the weather, out of 7 days in the park we had only 1 rainy day and it wasn’t pouring rain, wind didn’t bother us too much. You have two options of getting here from Puetro Natales; taking a bus or hitchhiking. Buses leave every day at 7.00am (we’d suggest to be there earlier to get a spot on first buses) and 2.30pm (in high season; December – February) from Puerto Natales, most hostels and hotels sell bus tickets. It takes about 2 hours to get to Laguna Amarga entrance. Price CLP 15 000/US$30 return pp. To get to Torres del Paine from Punta Arenas you must first get to Puerto Natales and then take a bus to the park, the same for other towns in the area. Hitchhiking might be difficult in season there are many people on the road all depends on your luck, it’s better to start early. We hitched in March and were quite lucky to get to the park in two rides, it took us 3 hours in total just 1 hour longer than by bus. To get back to Puerto Natales you can catch two buses, one leaves in the afternoon and one in the evening, they stop at three different park entrance. In season (October to April) entrance is from 7am to 10pm; off-season (May to September) – from 8.30am to 5.30pm. There are three entrances to the park (which one to choose depends on your route; Laguna Amarga – O-circuit and day hikes (if it’s the closest entrance to your accommodation). You can start hiking from the entrance or catch another bus that will get you to Las Torres – the official start, 7km. Bus costs CLP 3000/US$4,50 pp. Pudeto – W-trek, Q-trek, day hikes (if it’s the closest entrance to your accommodation), to get to the park you need to catch a catamaran, CLP 15 000/US$23 one way. Note! Administration office entrance (near Guardería Serrano) in high season can be used only for exiting the park. The stretch Paine Grande – Administración can’t be walked other way around. Inside the park there are three different companies running the campsites; CONAF (the National Forest Corporation) – runs free campsites; Italiano, Paso and Torres (closed for 18/19); Vertice Patagonia – runs paid campsites; Grey, Paine Grande, Dickson, Los Perros and Fantastico Sur – runs paid campsites; Torre, Los Cuernos, Frances, Seron and Chileno. The campsites can be booked online; book CONAF (they are still implementing new booking system as for July 2018 it didn’t work yet); book Vertice Patagonia; book Fantastico Sur. Don’t forget to print and take with your booking confirmation and passport. There are 2 campsites, they belong to CONAF, have very basic facilities, located next to rangers stations. To get a spot in season (January, February) you must book long in advance. Have much better facilities but in high season they get overcrowded to use any of the facilities e.g. shower or toilet you have to wait for a while. There are 9 paid campsites in Torres del Paine National park they are run by two companies; Vertice Patagonia and Fantastico Sur. Good facilities and moderate prices – between CLP 5000-6000/US$8-9 pp. Online booking is available. Two out of four campsites are opened all year around. They campsites are the most expensive one – CLP 13 000/US$20 pp. for camping with your own gear. Online booking is available. Pehoe (good stop for visitors with their own vehicle), at Pehoe lake, far from any treks, opened all year round, CLP 11000/US$17 pp. All the hotels are quite luxurious; rooms with nice views, private bathroom, heating, TV, towels, comfortable beds, breakfast etc. Some have option of full board with 3 meals included. There are more budget option as well (though everything here is relatively budget) called ‘refugios’, some of them have dormitory rooms and private with shared bathroom. Refugios Torre, Chileno and Los Cuernos can be booked through Fantastico Sur. 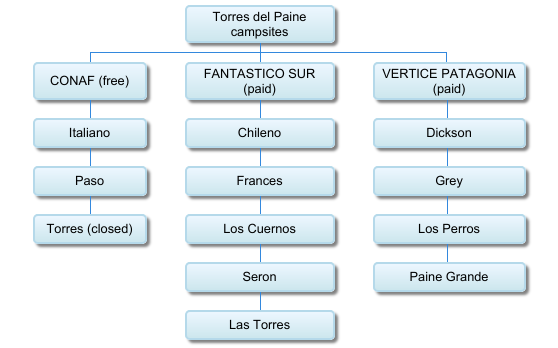 Refugios Paine Grande, Grey and Dickson can be booked through Vertice Patagonia. In high season chances to see wild animals in the busy part of the park (W-trek, day hikes) are quite small but you still can be lucky. We saw most animals on the O-circuit, in more remote parts of the reserve. If you’re lucky you can see a puma and our friends did see one walking near camping Serron one morning. Grey and red fox – you have good chances of spotting them on the longer routes. Huemul – local deer, we saw a couple of them but from far. Guanaco – a bigger and wilder version of llama. There many smallish mammals; Patagonian skunk, dwarf armadillo, condor, rabbits and mice. In Puerto Natales everything is about Torres del Paine, it’s the closest to the park biggish town; many hotels and hostels, a couple of campsites, restaurant, gear rental shops etc. Here you can get all the info about the trek, book campsites or hotels in the park, buy food for the hike and maybe upgrade your gear (if it’s necessary) etc. The cheapest accommodation option is to camp there are two or three campsites in the town the main drawback of camping is you and your gear can get wet before you start the hike if you’re unlucky with the weather. If camping on the trek was enough for you and you’d rather stay in a warm and comfort room, there are several great options for different budgets. In the last years rules in Torres del Paine have changed quite a lot make sure to buy an updated guide book. Great post and loads of useful tips there! Thank so much! Do you think we can actually book something when we actually arrive there? Hello, Dora! Thank you for the comment! Are yo trying to book paid campsites? It’s very strange that they are full as March is the end of the season and there aren’t usually that many people. Fantastico Sur has a life chat on their site they usually reply quite quick, you can try to ask there about available campsites for your dates. When we were there it looked like paid campsites always have place for people the main problem was the free campsites. If you’re trying to book Italiano the only free CONAF campsite on the W you can try to do it in Puerto Natales at CONAF office, that campsites is very big there might be spots left for March. We walked the O in the beginning of March and booked all our campsites in Puerto Natales just 2 days before the hike but we had several extra day on the O before joining the W route. Love your article, very useful. I am considering running either the O or Q circuit. With this in mind I only want to travel light. Can you recommend any companies that do baggage transfers from campsite to campsite? Superb article. I am in the midst of the bookings for our trip in march – pretty hard stuff getting this done. Right now I got Seron through fantastico. I got bookings at Dickson, los perros and Paine, but vertice site told me that the paypal transaction did not go through (but I received a email from paypal that tells me it did!?). Did not receive any confirmation letters from Vertice. When I tried to book Paso CONAF (since Grey was full) it as well is full. So maybe we have to walk all the way done to Paine from Los Perros? Hello, Rafael! Thank you for your comments! Regarding your booking through Vertice we’d recommend to contact them and ask about your booking and payment (if it went through or not). CONAF online booking system doesn’t work proper it might show that Paso is full just because it’s too early to book or maybe it just doesn’t work at all. We did the O in March and got all the campsites booked just a day before we started. We camped mostly at free campsites and only at two paid campsites; Seron and Dickson. CONAF campsites we booked directly at the office in Puerto Natales, paid campsites we didn’t book at all just showed up and there always was enough space, in fact they were half empty, March is the end of the season and there are not that many people. The most difficult part was to book free campsite in the southern part (on the W trek) but even there paid campsites always had space. Good luck with you planning and booking! Incredibly informative article. Thank you for sharing your knowledge! I have a question for you: in the article you talk about the O route closing 31 March in the 2018/2019 season. I am just wondering if you know if that means you must be out of the park by this date? Or does it mean you can’t start after this date? I’ve struggled to find any accurate information on this. Hello, Clare! Thank you for your comment! We finished the O before the closing time I can’t tell you for sure if you have to finish the hike by 31st or not but you can definitely be in the park after that date as the park stays opened all year (the south part of the park). I’d suggest to contact one of the companies that runs campsites on the O circuit; Fantastico Sur (you can leave a message on the site, they reply quick) or Vertice Patagonia they will know when the route closes. Hi wanting to do this soon. How do park fees, permits work? Do we do this online or once we get to the park? Any other fees? Hello! You pay the park fee at the entrance, cash only. If you’re planning to camp or stay in hotels inside the park you pay it separate. You have to book campsites or hotels beforehand, online. No other fees. For more details, please, read this post, it has all the information. Great post! My wife and I did the W circuit in 2010 and had a great time. Such beautiful views and amazing water colors down there. The hike out was brutal but in the end, it was a great trip! Really interesting article! I will be doing this probably as part of a round the world trip, therefore it will be hard to bring camping gear myself. Would you recommend renting or buying used stuff? I think the tent, sleeping bag and the mattress are the most important ones. Thanks in advance for your response! Hello, Jonas! Thank you for your comment! We had our own gear but we know it’s possible to rent or to buy camping gear in Puerto Natales just remember everything is quite expensive there. We bought all our stuff in Cusco, Peru it was so much cheaper than in Chile or Argentina. Especially if you want to rent a proper sleeping bag, tent, mat etc. We calculated that to rent these things in Puerto Natales for 7 days would cost us more than we paid for them in Peru. So our advice if you go to Peru or Bolivia first buy camping gear there. Good luck with your round the world trip! What do you think is a realistic daily budget for 2 if we have a tent and and camp wherever possible? Thanks! Hello, Anna! Thank you for the comment! You can buy wine in Puerto Natales for not much more than in Mendoza, wine is probably the only one thing that is not expensive even in Patagonia! But in Mendoza for the same price you can buy a better one.